In order to improve healthcare of injured people, deacetylated acemannan extracted from Aloe vera leaves, having high inhibitory properties, was used as an antimicrobial finish on traditional cotton items. Response surface methodology was employed to define quadratic relationships between the polysaccharide grafting degree and the treatment process properties. An optimized modification process, offering the highest funtionalization degree, is obtained. The cellulosic fiber morphology and roughness modifications induced by polymer grafting are revealed using Atomic Force Microscopy and Scanning Electron Microscopy. Infra Red spectroscopy was used to confirm the grafting effectiveness. Thermogravimetric Analysis and Differential Scanning Calorimeter were further employed to confirm chemical modification. Considering the potential use of this new biomaterial, original properties were also studied. 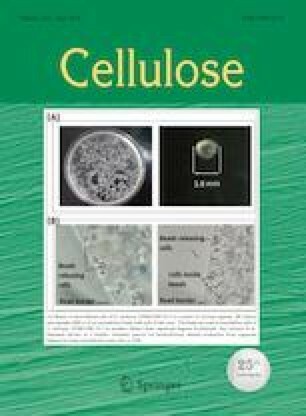 Finishing treatment seems to preserve mechanical properties, and hydrophilicity of the cellulosic substrate. MTT assay were done in HepG2 cells to ensure that the obtained dressings are non-toxic. The biomaterial showed high biocompatibility and promoted cell viability. 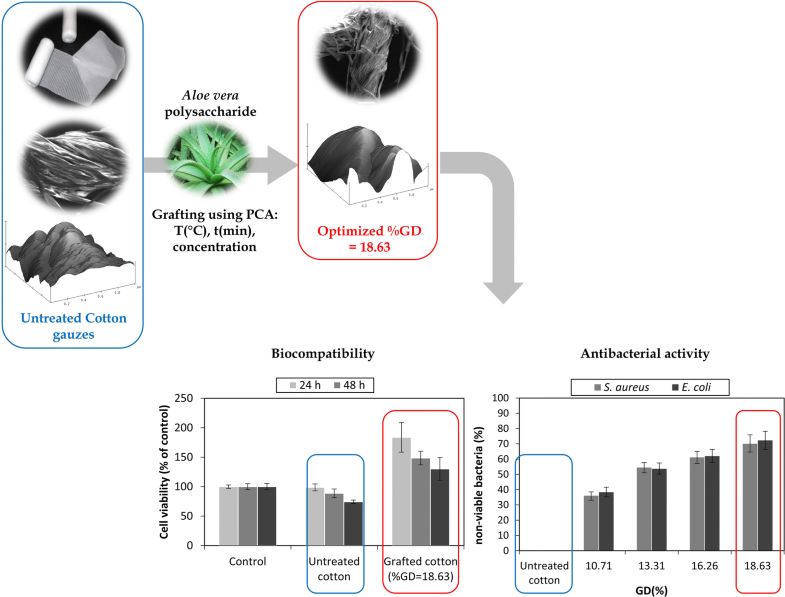 Antimicrobial studies showed that grafting treatment conserved polymer antibacterial activity. Optimized cotton dressings exhibited a significant inhibitory effect against Staphylococcus aureus and Escherichia coli bacteria, killed respectively at 70.2% and 72.4%. The online version of this article ( https://doi.org/10.1007/s10570-019-02419-8) contains supplementary material, which is available to authorized users. The authors would like to acknowledge the University of Monastir, and, Tunisian Ministry of Higher Education and Scientific Research, for giving the opportunity and making easy, the achievement of this work. In addition, the authors thank the Laboratory of Analysis, Treatment and Valorization of Pollutants of the Environment and Products in the Faculty of Pharmacy, for biological studies. This research did not receive any specific grant from funding agencies in the public, commercial, or not-for-profit sectors.